The Panasonic Cordless iron is on my Christmas list. I was shopping for pricing today online, and see that there are a few to choose from....the 600, the 602, and the 607 is stated to be "Advanced". I am thinking that the ceramic sole plate would be better than the stainless steel? Ladies just wanted to check in and tell everyone Happy Veterans Day, if you know anyone who is a veteran let them know they are appreciated and thank them for their service and take a moment of silence for those who sacrificed everything for us. My mom, my husband. my daughter - all Navy vets. It is hard for someone outside the military to understand the full extent of the sacrifices made from our military personnel, and their families. Be thankful for and supportive of them all! Two more birthday packages arrived this weekend, thank you Happy lab and Patty jo. Spent a productive weekend in my sewing room this weekend. Completed 6 Christmas presents. Two more to go before thanksgiving. I'm going to do a thanksgiving/Christmas visit to GA over the Thanksgiving weekend. A little sad as Thanksgiving and Christmas was my father's favorite holidays. Good morning from rainy Georgia. Looks like today through Thursday will be rainy. I shouldn't complain about the rain with those wildfires raging but it’s so dreary. Wish I could send some of this out West. I’ve been busy visiting my sons in KS and with home projects so no real quilting is getting done. Hoping all of you are well. And Barb, I hope you enjoy your new job when your hours settle down. Working some 10 hour days. I know some people do this all the time but I am not one of them! I get home around 8:00 eat something fall asleep on the sofa for about 2 hours then I’m up for a few hours ... very crazy. Then I start all over again. My shop was suppose to open this Thursday but we moved the date to next Monday. I think that is more realistic. I will be glad when it opens. I can’t remember if I told you what the shop is. We are a resale shop that sells donated items. (Almost everything). We are a non-profit organization working with the public school district giving employment opportunities to social needs students and adults. There will be 3 paid managers (I am one of them). and the special need employees will also be paid. The rest of the workers are volunteers. This week we have all of our inspections then we can be up and running...as soon as we pass them. Fingers crossed! Armylady....thank you for your service protecting our country. Barb it was my pleasure to serve wish I was still in the Army, but once a soldier always a soldier. mailed Nov. birthday candies out today! I recieved three more birthday wishes yesterday, jarenie, LUM, oldcatlady. Thank you. I can't wait to open them. OK, does any one remember where I put my plastic with all my little packages of swapping squares ready for the mail. I rearranged my sewing room and stirred up the elves. Their revenge is to hide my/your birthday treats! Grrrrrrrrrr. Back to the search! I found them! As I was walking past my bedroom door, I saw a basket with some familiar papers sticking up over the top. Indeed my little birthday swap treats were in a charming little basket along with the stamps and envelopes in my bedroom on the shelf of my desk. Oh the pain and frustration of organization! I will apologize to the elves and leave them treats or some kind this evening. They were not guilty, this time. Now it is time to get the November birthday treats into the mail. All candies were put in the mail a few days ago. I haven't been on much as my real estate business is keeping me busy lately. I know how you feel, Barb! I was a stay home mom for 28 years and now work 7 days a week. Yesterday I started at 6:30 a.m. answering emails/texts and finally finished working at 9:30 p.m. It won't always be like this, but it takes a lot of time to build a business from the ground up. Hang in there! 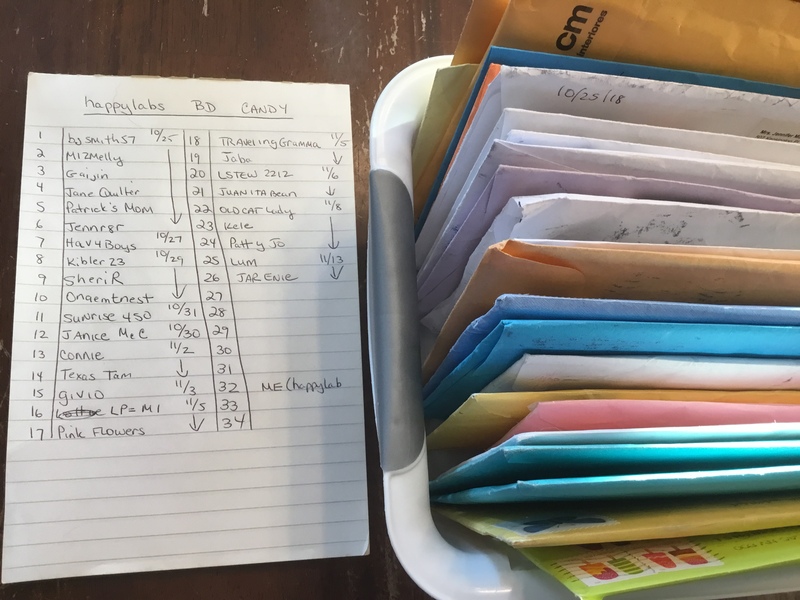 Received list: Armylady2012, BarbaraKibbler23, bjsmith57, CrazyConnie, Gaijin, Happylab, Hav4Boys, jaba, JaneQuilter, JaniceMcC, Jarenie, JENNR8R, JuanitaBean, Kele, LStew2212, LUM, MizMelly, Onaemtnest, PatricksMom, pattyjo, pinkflowers, SheriR, sunrise450, Texastam, travelinggramma. One of the birthday girls (Me), has climbed out of the sewing room jungle. I’m so terribly sorry I did not post this info before. I tried to post several times, but get a message stating i’m Not signed in. Very trusting. Anyway I hope this works. I figure a pic may work. So here is my current up to date list of who I have received from. This is today, prior to getting my mail. Yea, so far it worked, yea, yea, yea. By the way I’m waiting until my birthday to open them. Traveling gm, I love your blocks. Hello my birthday friends...it is Friday. The weekend is here whoop whoop!!! Another card yesterday, thank you! Received list: Armylady2012, BarbaraKibbler23, bjsmith57, CrazyConnie, Gaijin, Happylab, Hav4Boys, jaba, JaneQuilter, JaniceMcC, Jarenie, JENNR8R, JuanitaBean, Kele, LStew2212, LUM, MizMelly, oldcatlady, Onaemtnest, PatricksMom, pattyjo, pinkflowers, SheriR, sunrise450, Texastam, travelinggramma. Happylab I mailed your package on the first of November, have you not received it. All my packages are in the mail. Last edited by WMUTeach; 11-16-2018 at 04:57 PM. An updated list of received Birthday wishes, I haven't opened them yet. I'm waiting for next Saturday. Happy Saturday. . Here are some 60 plus 4-patches I made from the off-sized squares I have. 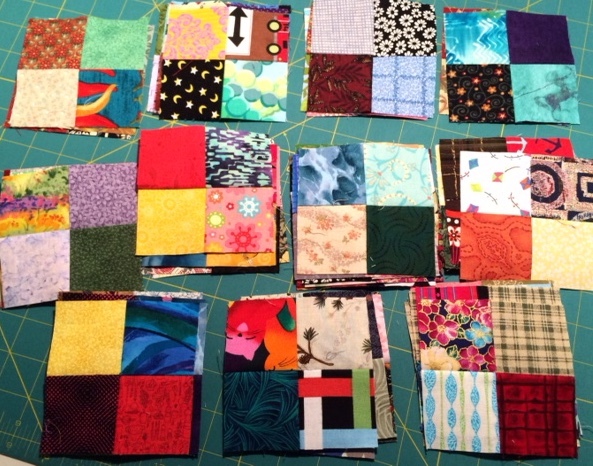 About half are “oops” squares I cut through the years or scraps I put together. I made the patches and then cut them down to 4 inches. No squares I receive ever go to waste, even the smallish ones that make it in with the perfect candy squares. Exactly what they’ll be is up in the air because I’ve still got tons of scraps and small pieces yet to work on. 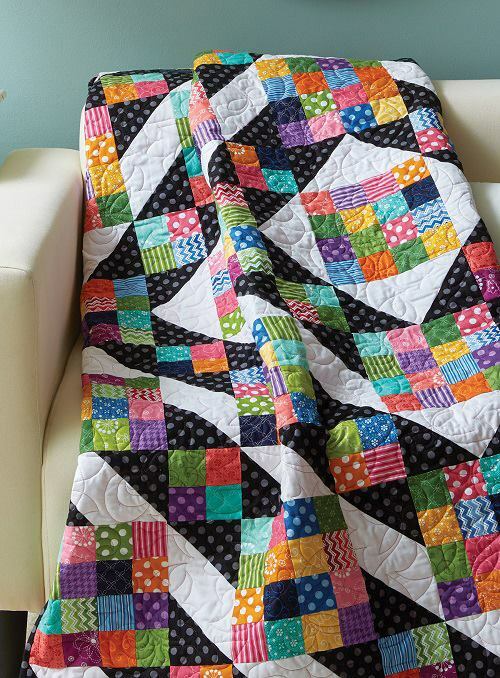 But I thought I’d show you what I do with some of my candies that don’t quite make the cut into other quilts. Great idea, Janice! Thanks for sharing. I just put all the November in the mail today. Hoping they all arrive in time!